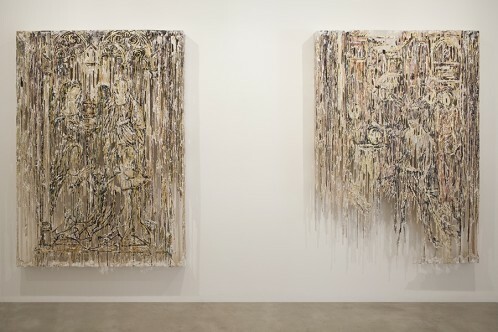 The OHWOW Gallery is currently presenting its first solo show featuring the Syrian artists Diana Al-Hadid. The Piazza San Marco has been Al-Hadid’s primal source of inspiration for Ground and Figure. From then on, she continued her research and exploration of the 3D paintings by using a very unique technique. In order to create volume, Al-Hadid combines polymer gypsum, fiberglass and plaster, held together by a skeleton of steel, finally covered by golden leaves. 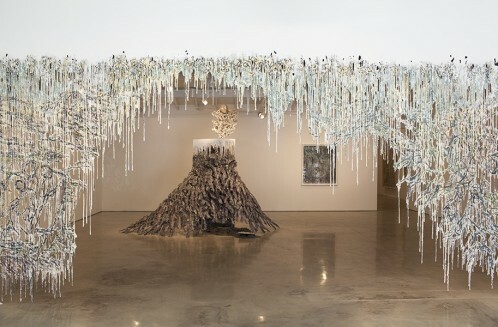 By using this avant-garde technique, Diana Al-Hadid creates large-scale installations that inhabit the space of the gallery. In honour of her show, she made a structure alluding to a bottomless wood grotto. Playing with the material and its visual rendering, the top of the construction appears as made out of ice. She welcomes the visitor by a way underneath an ice-looking curtain. Every piece is an assembly of diverse motives that can be interpreted in many ways. Al-Hadid opens her works to a general vision by referencing to old masters as well as by using experimental and innovative means to achieve the aims.